Russell McGilton takes a unique flight with the last of the wilds predators. If ever a vulture was to have a name it surely would be called Kevin. An Egyptian vulture (neophron percnopterus), Kevin was bald, unkempt and wore only brown plumes. His sharp upturned beak gave him a deeply disappointed grimace as if he was all too painfully aware of the ruffled form his soul had taken. ‘We named him after one of our clients,’ Kevin’s handler, Scott Mason, said in his cheery East London accent while holding Kevin on his arm as our taxi lurched around a bend. We were heading out of the tourist lake town of Pokhara, Nepal, a popular spot for trekkers to either stock up on supplies or cool their heels from the days of trekking the Annapurna mountain range. Our destination was 1500 metres further up to the small hillside town of Sarangkot where we would both jump off the side of a mountain while Kevin would chase after us. Oh, this also involved strapping on paragliding equipment, hence the sport is called ‘parahawking’ (‘paravulturing’ doesn’t quite seem to work for some reason), a rather new sport started by Scott after holidaying in here in 2001. 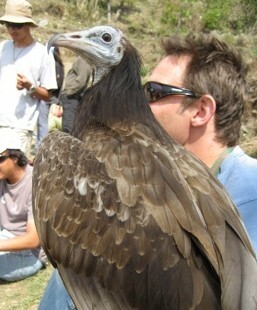 After reclaiming sick and abandoned chicks from local farmers who had to be talked out of eating them, Scott and Adam started the Himalayan Raptor Rescue Project and now have a healthy number of eagles, hawks, kites and vultures not just for parahawking but more importantly for breeding. Avian predator numbers have fallen heavily in recent years around the world, the sub-Indian continent being hardest hit with almost ninety-five percent of vultures wiped out. With carrion not being eaten, feral dog populations have exploded in Nepal while in Mumbai, the Parsi community, who once relied on vultures to consume their dead, now use solar collectors to hasten decomposition. The logging of vulture’s habitat and the use of an anti-inflammatory on cattle, Diclofenac, (it destroys the renal system of the birds who have fed on the carcass) have widely been blamed for the vulture’s demise and within in five years it’s estimated vultures and other raptors will be extinct. At Sarangkot, the sky was already busy with the pink, yellow and blue chutes of paragliders buzzing around each other like gnats. I watched a passenger of one kite scramble clumsily on an invisible bridge as she cleared the launch site – an eroded patch of soil. Once Scott was ready with our glider he attached a radio antenna to Kevin and released him. Up he went flapping his enormous wings and disappeared into the ether. In a few steps we were airborne. We dipped suddenly, heading for a line of trees, but then a gust of wind had us shooting upwards. The altimeter beeped frantically, increasing in pitch as we climbed on the thermals to over 8,000 feet. At this pre-monsoonal time of year, the valley was misty, the heat and moisture moving up the valley. Newal Tal Lake below us looked like a half-full kitchen sink while the contoured and barren farmlands fell in big heavy steps away from the snow-capped ranges of the Annapurnas. Kevin was flying in slow loops above us while steppe eagles and griffon vultures and hawks floated above him like leaves in a magical slow wind. Kevin had been taken by steppe eagles before and was lucky to have escaped with his life. Scott blew a whistle. I held out my arm. From above I saw Kevin break from the other vultures then dive like a Stealth Bomber before levelling out, matching our speed, his huge wings fluttering as he braked and then quite effortlessly, clamped himself to my gloved wrist. He pecked at the meat, swallowed it, blinked an eye blankly at me then took off in wide arc. I readied for the next feed. Again he came in but this time I dropped some of it. In a micro second Kevin shot after it and caught it like he’d spilt a crumb. ‘Oh, right.’ Not the way to treat an endangered bird. Scott adjusted the steering line and we started our descent. Below us another paraglider, its red wing a brilliant contrast to the shimmering green lake under it, spun downwards in tight aerobatic circles and within seconds it landed, its wing deflating and falling onto the road. We soared down in a slow U-turn to a circle on a green paddock. ‘Get out of my harness?’ Funny, I thought, how ‘paraglider’ goes with ‘paraplegic’. I did and shot forward, legs dangling, like a toddler in a sling. In we went and within seconds my legs were already touching the ground, landing with such gentle force as if I’d jumped off a small chair. Scott unclipped me and I sat down. He blew his whistle and Kevin whooped down and gorged himself on buff morsels lying limply on the grass, tourist happily taking photos of him. It was then I realised I had a new kind of respect for Kevin. He may have looked like an awkward lonely trainspotter but in flight, Kevin was a handsome knight, a wondrous free spirit. Perhaps parahawking, as it gains greater prominence, and tourism, with all its thorny downsides, may be the saviour of all Kevins around the world, great and small, and their unique magnificence.